Sandwich is a popular food item consisting one or more types of food placed on or between slices of bread. It's also easy to make, thus there is an endless number of sandwich variants in the world. 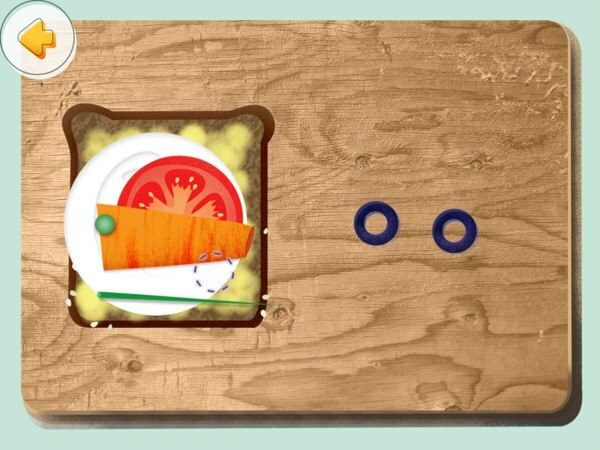 Both my sons love to try different kinds of sandwiches, so they were really excited that they could create their own sandwiches in Duckie Deck's latest app: Sandwich Chef. Chop ingredients into fun shapes and use them to decorate your sandwich. 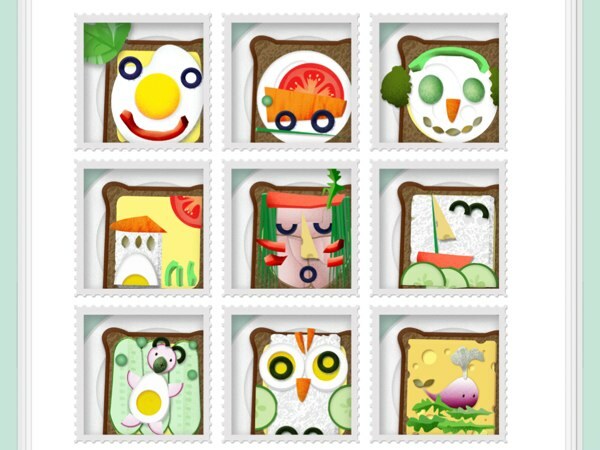 To start playing, select one of the sandwich designs provided in the app. Each design has its own set of ingredients and step-by-step instructions. After showing all the ingredients briefly, the app moves them to the side of the screen. The first thing to do when preparing your sandwich is applying butter on the bread. Then, you take one ingredient at a time, chop it down to one or more pieces, and lay them out to decorate the sandwich. These ingredients form unique shapes, such as a smiley face, car, or snowman with headphones. Then, you can eat the sandwich and prepare a new one. There are 10 sandwich designs that you can prepare. They include both animals and other objects, such as a koala, an owl, or a small boat. The recipes for these sandwiches use healthy ingredients, such as tomato, cheese, egg, lettuce, carrot, and broccoli. Sandwich Chef is intuitive enough for juniors ages 2+ to play on their own. They only need to tap an ingredient, and the app will split it up into the correct shapes and correct number of pieces. Placeholder grids will appear when each piece is dragged to show where it should be placed. The app also introduces the ingredients one at a time. This prevents juniors from feeling overwhelmed. It also teaches them to focus on getting one part of the design correctly before moving on to the next. If you have younger juniors playing Sandwich Chef, they can also practice their fine motor skills, especially when smearing the butter on top of the bread. There are 10 sandwich designs that you can play with. The first thing that I notice is the fun a capella background music used throughout the app. It creates a fun and playful environment when combined with the sandwich-making process as shown in the demo video above. It really inspired me to create a similar activity at home; I'll chop all the ingredients and let my kids design their own sandwiches. Sandwich Chef is also a great tool to teach juniors about healthy foods. Also, as you're allowed to get creative with how you arrange the ingredients on the sandwich, there's really no reason why the sandwich can't look great as well. After playing the app with my sons, I know I have to be more creative the next time I create a sandwich. All sandwich recipes use healthy ingredients for their designs. Duckie Deck Sandwich Chef is available for iPhone/iPad.